Got 8 postcards out to PSPrint. Broken order. Some the 500 qty. Some in smaller batches. Plan is to make little decks of them with clear envelopes and nice little notes with a business card (going to be crack and peel) to send out to galleries around here (Ithaca, Tburg, Corning, Skaneateles, Cazenovia, Cooperstown, Rochester) and some in Florida (Key West, Miami) to see if we can get a little traction with the bird pix.Just requested an application to see if I can join the State of the Art Gallery in Ithaca...to move more locally. Also, just "did" the newest Choker's CD and sleeve graphics which will hopefully move to the website "look and feel", a tee shirt and the appropriate band offerings/needs. Have worked it out with them to buy 100 CDs from them to send to existing clients along with the postcard collection to say "Hey!" and point out that this monkey can make pictures too. When I get them, I will offer 10 CDs to the first ten requests outside of the Tburg/Ithaca area to get the Chokers to the wider world. Requesters know that they are really fun and --but if old time music isn't your thing...then maybe this is the place you can start! 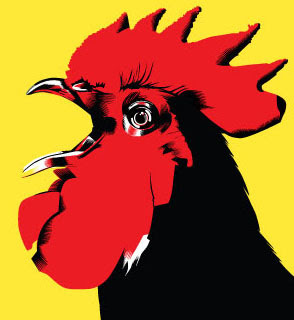 The chicken(above) is featured promenantly on the soon to be released CD.